Epigrams, the briefest of Greek poetic forms, had a strong appeal for readers of the Hellenistic period (323-31 B.C.). One of the most characteristic literary forms of the era, the epigram, unlike any other ancient or classical form of poetry, was not only composed for public recitation but was also collected in books intended for private reading. Brief and concise, concerned with the personal and the particular, the epigram emerged in the Hellenistic period as a sophisticated literary form that evinces the period's aesthetic preference for the miniature, the intricate, and the fragmented. Kathryn Gutzwiller offers the first full-length literary study of these important poems by studying the epigrams within the context of the poetry books in which they were originally collected. Drawing upon ancient sources as well as recent papyrological discoveries, Gutzwiller reconstructs the nature of Hellenistic epigram books and interprets individual poems as if they remained part of their original collections. This approach results in illuminating and original readings of many major poets, and demonstrates that individual epigrammatists were differentiated by gender, ethnicity, class status, and philosophical views. 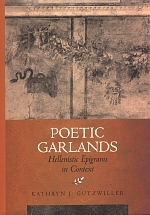 In an important final chapter, Gutzwiller reconstructs much of the poetic structure of Meleager's Garland, an ancient anthology of Hellenistic epigrams. Kathryn J. Gutzwiller is Professor of Classics at the University of Cincinnati. She is the author of Studies in the Hellenistic Epyllion (1981) and Theocritus' Pastoral Analogies: The Formation of a Genre (1991).